Daemons Domain - All Souls Trilogy & Universe Fan Site + Podcast: Daemons Discuss - Podcast: Special Edition! | A Conversation with Aly Davis - Fan of the All Souls Trilogy and Our Favorite Yogini! Daemons Discuss - Podcast: Special Edition! | A Conversation with Aly Davis - Fan of the All Souls Trilogy and Our Favorite Yogini! 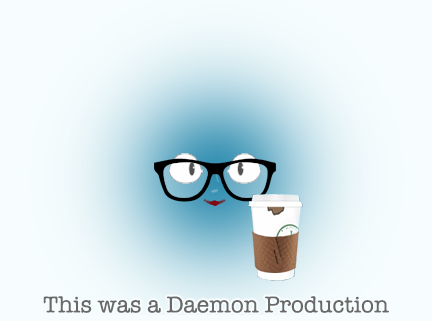 Description: If you've followed us for a while, you'll remember our Daemons Domain guest blogger, Aly Davis. 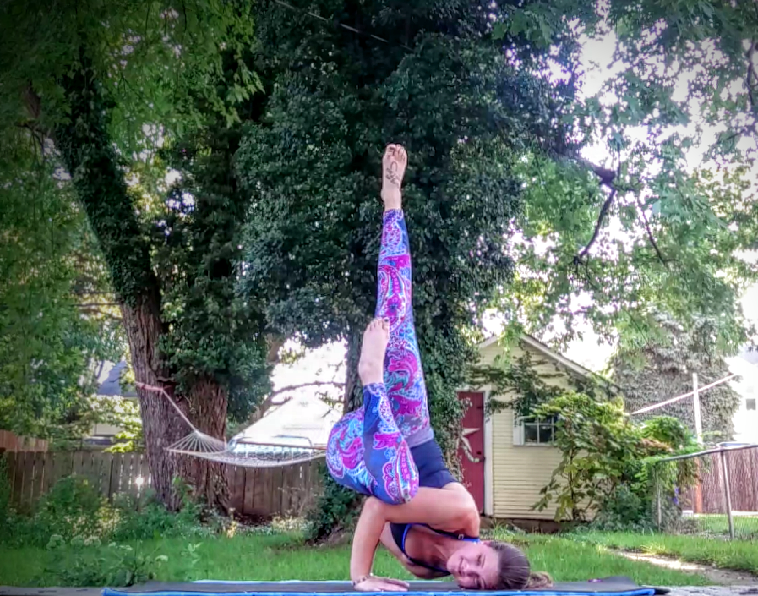 She's an All Souls Trilogy fan and a fearless yogini that we ran across while perusing Instagram. The rest was pretty much fate! 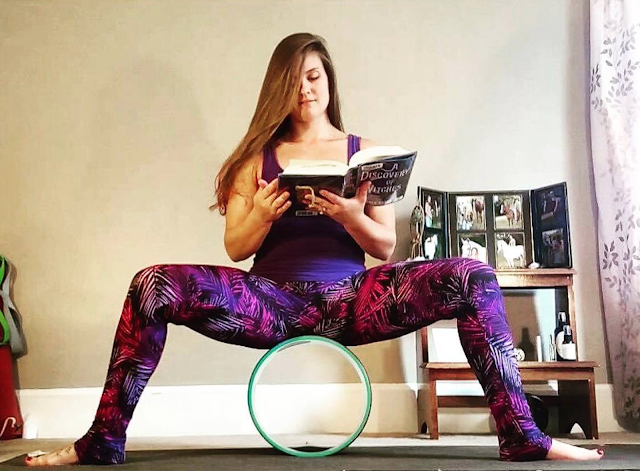 That was and remains our most popular post (minus giveaways), because she was able to expertly dissect the connection of yoga and the All Souls Trilogy. She took us on a journey into Diana and Matthew's world, and told us how creatures would theoretically benefit immensely from yoga classes. At the end of it, the reader totally understands why they spent five pages listening to a Rocket Man cover (in their heads), and comprehended the mood of the room at Matthew's house in Woodstock. She's been featured as a Real-Time Read Along subject on Deborah Harkness' site, and her Instagram posts are inspirational. She's one of our favorite people in this fandom, and we are thrilled to be able to talk to her as our first guest on this podcast! We hope you enjoy listening to this episode as much as we've enjoyed producing it. ~ A long episode, but worth every second! We are always conscious of time, because we don't want to waste yours! We figure as long as the content is valuable, an episode winds up as long as it needs to be. This picture is how we found Aly on Instagram! 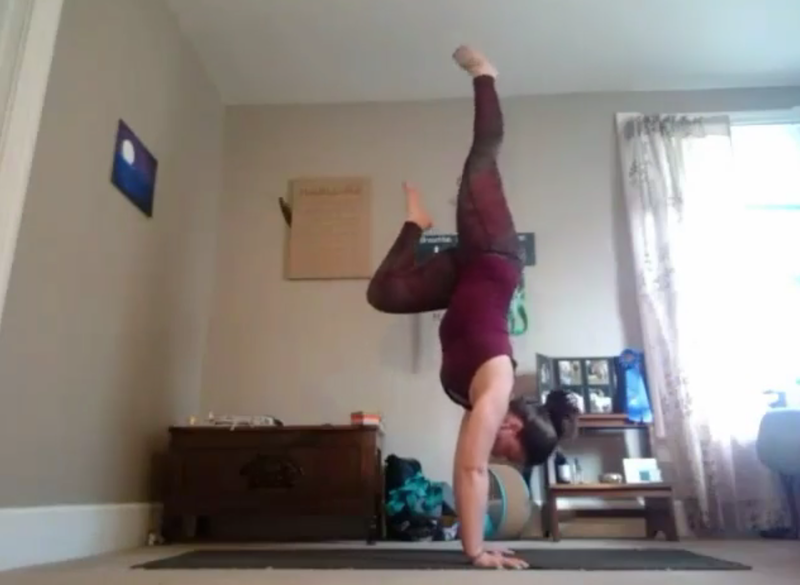 Aly tenaciously popping up into her handstands! * (07:50) – Aly’s relentless/tenacious when she does handstands! See photo above (Instagram gets touchy with it's embedded coding, so we grabbed a screen shot, and you can view the video here). * (09:15) – Aly says that you don’t need to be flexible to do yoga. When she began, she could barely touch her toes! * (10:53) – Aly found the All Souls Trilogy through a friend. She borrowed A Discovery of Witches from the library and she was hooked. The Book of Life was the first book she's ever pre-ordered. Letting go of the ego, on the other hand, is a much harder task. For everyone, the ego is what keeps us comparing ourselves to others and what bogs us down when we don't feel like we have/are/can do enough. This is an especially potent piece of the puzzle in this particular class full of vampires, witches, and daemons who have been taught their whole lives that no other creature is as "good" as them and who have generations of ancestry to live up to. We're talking genius daemons who are rivaling Steve Jobs and Sir Isaac Newton, vampires who have thousands of years of built up ego (not difficult when you're naturally gorgeous and more cultured than most everyone else you come in contact with), and witches with grimoires going back hundreds of years, chock full of spells from witches whose reputations they must live up to. Ego plays a huge role in the entire series of books but for this amazing five pages we catch a break; a break we didn't even know we would need as badly as we do. * (16:52) – We concluded that yoga was a common ground that Matthew Clairmont found with Diana Bishop, why not get to know her better that way. Matthew seemed to be tuned into what Diana needed. He even smells it! "Some performed death-defying arm balances and handstands, but I wasn't among them. Clairmont was, however." Fallen Angel Pose - Deb does say on her site that this *is* Matthew's impossible pose. * (20:46) – Physical practice vs. mental practice. 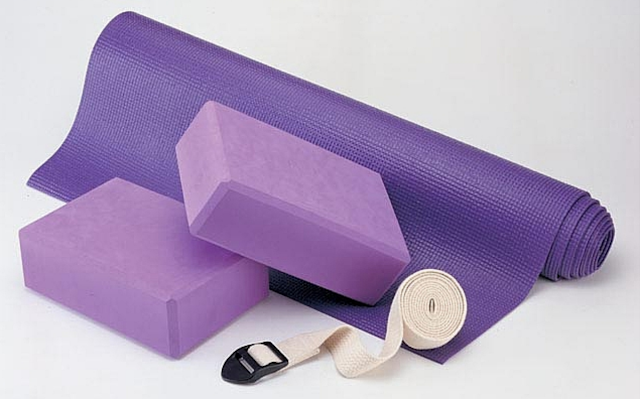 Yogic meditation came first, however Asana practice resulted from it. People who participated in meditation wanted to be able to strengthen the body for longer meditation sessions, and the physical practice was the natural solution to remedy it. Breathing is the main focus while moving. * (24:14) – Ayurvedic medical practioner - Ayurvedic medicine (also called Ayurveda) is one of the world’s oldest medical systems. It originated in India more than 3,000 years ago and remains one of the country’s traditional health care systems. Its concepts about health and disease promote the use of herbal compounds, special diets, and other unique health practices. India’s government and other institutes throughout the world support clinical and laboratory research on Ayurvedic medicine, within the context of the Eastern belief system. But Ayurvedic medicine isn’t widely studied as part of conventional (Western) medicine. What is Ayurveda? * (25:26) – Here’s where we try to convince Aly to do a podcast. Her mom’s tried to get her into YouTube! Apparently we aren’t the first to tell her to teach this publicly. Who knows? All Souls Trilogy yoga instruction may come eventually to your small screen or earbuds near you! It's how we (at Daemons Domain/Daemons Discuss!) wind up doing most of the things we do. A thought or an idea becomes an action in due time! * (29:17) – Huge shouts out to Discussers Jennifer W, Jennifer K. and Susie for their questions! * (31:28) – Aly mostly practices at home with Yogaglo.com – she says there are 6 or 7 teachers, different levels, and different types of yoga. It’s 18 dollars a month, and she swears by it. She also says that she wouldn’t be surprised if the instructors are daemons. Maybe one or two of them are vampires or witches. * (31:18) – Savasana is probably not for Diana, because it’s a vulnerable position and she doesn’t feel comfortable. Aly says it’s hard to find peace in that position for some people, because you are supposed to lay there and let it all go. The other pose that Amira suggested probably worked better because it's more of a protected position allowing Diana to relax. * (37:45) – The recovery position is mainly something used while someone is in shock, and the US Air Force co-oped it for self-aid and buddy care. It’s used after triage is conducted, and/or if someone is not in a good mental state. In a war zone it's not practical most times, but when one is able, it is a suggested method to 'get your mind right'. This was brought up because Angela mentioned her mother always instructed her as a child to get into a fetal position when she wasn't feeling well, and Valerie recalled the recovery position being used for this in Self-Aid and Buddy Care (or SABC) in the USAF. 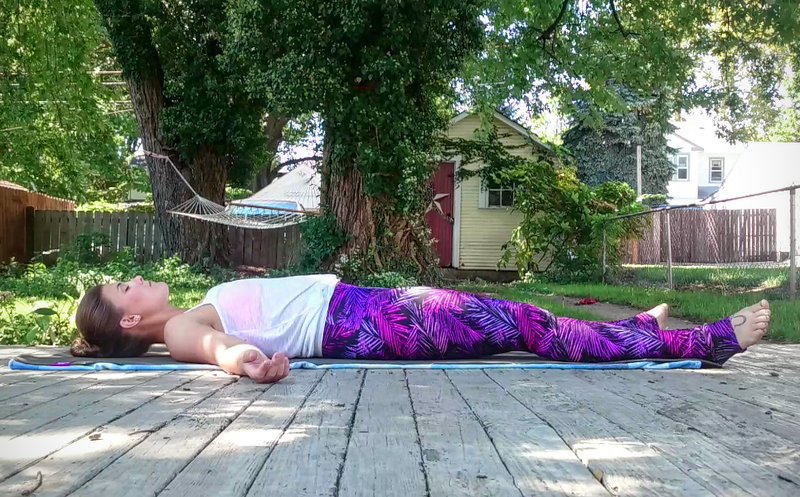 We made the connection to Diana's Savasana variation through these memories. 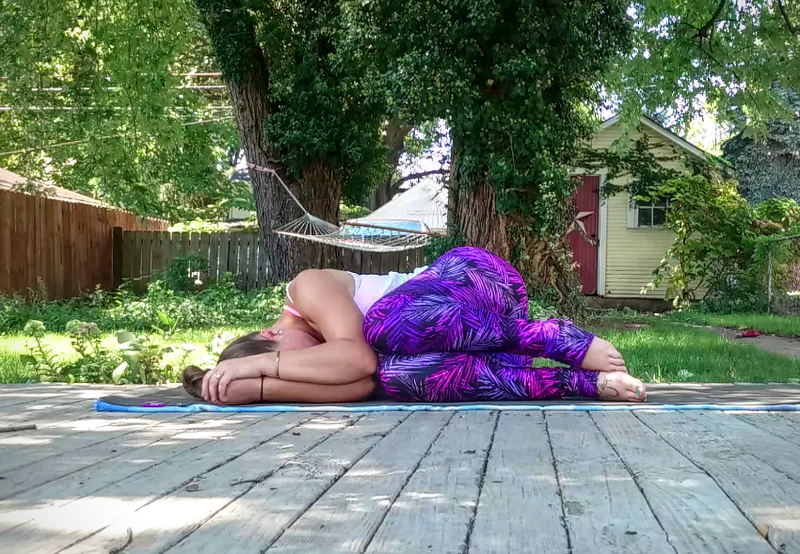 * (43:10) – Anxiety releasing positions or poses: Aly says there are two different days everyone has; the days with pent-up negative stress or energy: she does core work, deep back bends. Her favorite poses for this – camel, wheel, cobra rolls, splits, wild thing, boat pose, plank holds, side planks, bicycles, leg lowers. The other type of days; on days she’s too exhausted, yet still stressed: hip openers, forward folds. She says most of us hold stress in our hips and lower back (male or female). Fire log, double pigeons, thread the needle, butterfly and side bends, or supported back bends are poses she uses for these days. * (49:58) – Packing using a rolling technique – we couldn’t find the specific post on Facebook, but this is the same system (aka the "Skivvy Roll"). Yoga pants are easy to pack, and doesn’t require the socks! * (51:01) – Aly is an ambassador for these two companies: Confused Girl, and Alter Ego – she has coupon codes if you are interested – hit up her Instagram, and you can get the coupon codes and 15% off! 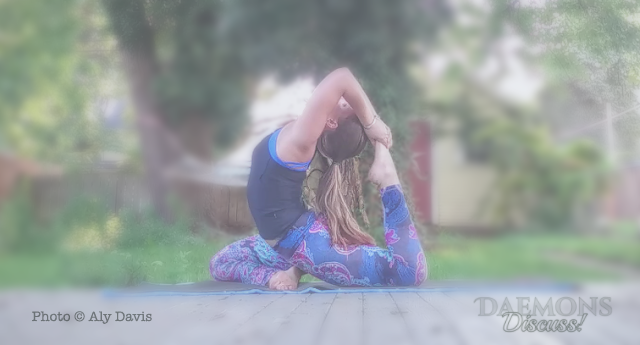 * (52:56) – Good yoga leggings are pretty pricey. You’d have to be serious about yoga, or a proponent of wearing leggings as pants! Also, you get what you pay for most times. Shop around. Aly found some of her favorites (by lululemon) at a thrift store. * (56:53) – Aly was asked to conduct a workshop at All Souls Con later this year, but she has the best excuse not to! 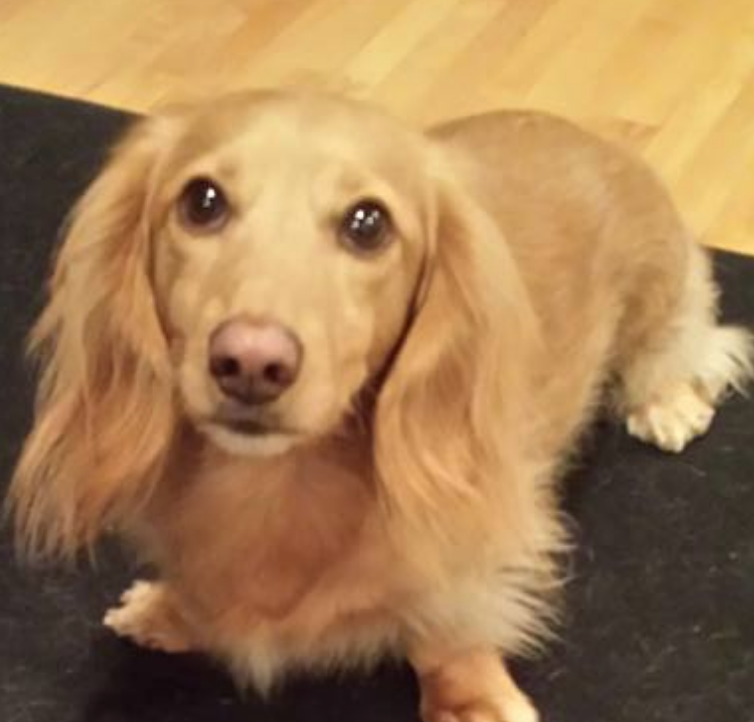 She’s expecting her first child, with a due date within days of the event. So she won’t be there in person, but she will be live streaming. Here's how to attend either virtually or physically: All Souls Con passes: $79, virtual passes: $0 (! --> thanks goes to Penguin Books for sponsoring the live stream) All early bird prices end the 15th of June, 2017 -- Virtual passes will remain absolutely free! Regular passes will go up to $99. * (1:01:05) – Promo break. See how to support & get a hold of us below! Scroll down, or click here. 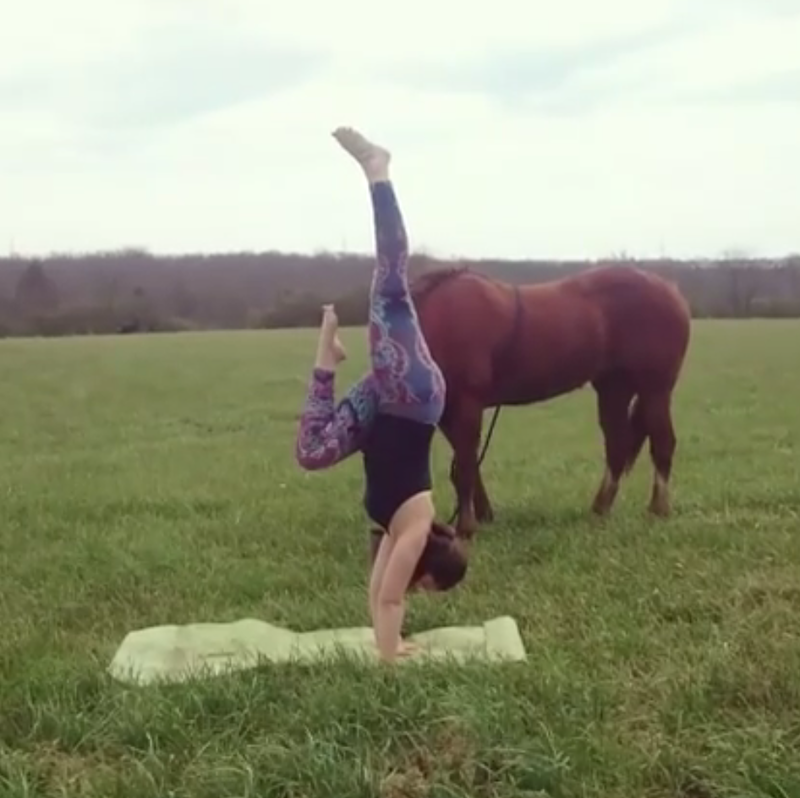 Dear producers of A Discovery of Witches TV, Aly is not only good with yoga, but also great with horses! * (1:02:49) – Aly can’t let go of the fact that the yoga scene is being cut (this makes her sad! - Deb's post on it), but she throws out an offer to the producers! * (1:04:01) – Where was Easter in this trilogy?! This makes Jean's Graham upset (this was recorded the week before Easter.) Lazarus got all of the resurrection love in this series. * (1:08:22) – Fandom politics. We’re over it. We are placing a call to everyone out there to put ego aside, and just do this fandom thing. There are enough real-world politics for us all to worry about. Let’s just have fun! It’s why we are strong proponents of All Souls Con. A. Call us at 1 (360) 519-7836 - Tell us your first name, and your message. Recording will shut off after 3 minutes. *Note - This is a U.S. number. International rates may apply when dialing out of country. Your message may be used in an episode; messages are subject to editing for clarity and brevity. Contact us using this form below: Please make sure to let us know if it's OK to read your email (or a portion of it) on future podcast episodes. If not, that's perfectly fine, too. Just let us know! Also, if you sign up for our "Discuss" email list we may send you the subject matter of a future podcast ahead of time - this way your inputs may even get included while we record! * Daemons Discuss! promotional break music: "Anachronist" by Kevin Macleod, licensed for use by Creative Commons.